TMS uses capacitors that can discharge a large current of up to 8 kA in a short time. The current passes into a coil where it produces a strong magnetic pulse of up to 2 T in about 200 µs that then slowly decays back to zero in about 1 ms. The coil positioned directly over a scalp lets the magnetic field pass through the skull of the subject and induces electric field in the cortex close to the surface due to the high rate of change of the magnetic field. This induced current then interferes with normal neural activity. The mechanism of this interference will be discussed later. The properties of the magnetic field depend on the shape of the coil. Originally, circular coils were used, but these produce a magnetic field that is circular rather than focal. It is therefore harder to selectively target the desired area. Combination of two circular coils creates a so called figure of 8 coil, which has the maximum magnetic field intensity at the point where the two circular coils intersect, thus allowing more focal stimulation. The electric current is induced most strongly in the upper layers of cortex. To reach deeper structures, other types of coils can be employed. A double cone coil is composed of two adjacent circular wings at an angle of 95°. This induces a stronger but less focal electric field relative to the figure of 8 coil (Lontis, Voigt, & Struijk, 2006). There are also other kinds of coils for deep brain stimulation, like the H-coil, stretched C-core coil or a circular crown coil (Rossi et al., 2009). It is important to note that when stimulating deeper brain structures, the induced current and thus also the TMS effect will be always greater in the overlying cortical tissue. Paired-pulse or twin-coil TMS protocol allows us to investigate cortico-cortical interactions, like the intracortical inhibitory (ICI) and facilitatory (ICF) mechanisms or interhemispheric interactions (IHI). After the application of a “conditioning” pulse over one area we can investigate whether and how it modulates the effects of a subsequent TMS pulse to another area (Driver, Blankenburg, Bestmann, Vanduffel, & Ruff, 2009). There are technical issues connected to this approach. For instance, the physical size of the coils prevents them from being positioned too close to each other, and the spectrum of effects of the secondary pulse is typically limited to directly observable effects like the excitability of the motor cortex or production of phosphenes. Repetitive TMS (rTMS) refers to application of a train of pulses with a frequency of 1 up to 100 Hz for a period of up to thousands of ms. This protocol is capable of creating a transient “virtual lesion” (see details below) in the brain and is therefore a suitable approach for the localization of brain functions. Compared to single-pulse TMS the effects are more robust and can influence for instance not only reaction times but also error rates, which has been used e.g. in studies of language (Claus et al., 1993) or memory (Grafman et al., 1994). There are two types of rTMS protocols: conventional and patterned. Conventional rTMS consists of a train of pulses with a certain stimulation frequency and duration. Compared to that, patterned rTMS is a repetitive application of short rTMS bursts at a higher inner frequency with short pauses of no stimulation. One popular example is the theta-burst stimulation (TBS), in which short bursts (e.g. 3 pulses) of 50 Hz rTMS are repeated at a rate in the theta range (e.g., every 200 ms, that is, at 5 Hz). There are also different paradigms of TBS: intermittent TBS (iTBS), intermediate TBS (imTBS) and continuous TBS (cTBS) (Huang, Edwards, Rounis, Bhatia, & Rothwell, 2005). TBS is often being used as an offline protocol to disrupt neural processing in a specified brain area before the experimental task. However, the sufficient amount of stimulation and how quickly the effect wears off can be unknown a priori. Even though MRI-based neuronavigation allows one to position the TMS coil above the desired neuroanatomical location rather precisely, the actual spatial specificity of TMS effects is difficult to assess and the general spatial resolution of TMS can be considered as medium to low. Area in which TMS produces some effect is several centimeters even when using a figure of eight shape coil. Lower stimulation intensity results in a more localized effect. However, to stimulate deeper areas (e.g., mesial temporal or frontobasal cortex) higher intensities must be used, at the cost of lower spatial specificity. Areas superficial to the intended area will be activated even more strongly and conclusions about what produced any observed behavioral effect will be difficult. Despite that, the distribution of the induced electric field can be modeled, and methods like the subtractive lesion analysis can give us considerable specificity (Walsh & Cowey, 2000). Also, a change of the coil distance from the scalp by mere millimeters (Stokes et al., 2005) or a change of position over different scalp locations by 1 cm (Brasil-Neto, McShane, Fuhr, Hallett, & Cohen, 1992) can produce detectable changes. This resolution is far better than is usual in clinical neuropsychology in the study of lesions. In any case, one cannot assume that the effects of TMS will be only local. Combined studies of TMS and positron emission tomography (PET) have shown that TMS-induced activity can spread to distal anatomically connected areas (Paus et al., 1997). Similarly, the application of TMS during electroencephalography (EEG) recording shows that effects of TMS can be observed in a homotopic region of cortex in the contralateral hemisphere within 20 ms after stimulation (Ilmoniemi et al., 1997). It is important to take these distal effects into account when selecting a control site. The point in time of the application of TMS can be specified very precisely and the effect at the site of the most intensive stimulation is almost immediate (less than a millisecond). However, the temporal resolution of TMS is limited by two factors: by the duration of the TMS pulse effects and by the duration of an area’s involvement in the task (Walsh & Cowey 2000). Effect of the pulse can last for a few tens of milliseconds (Ilmoniemi et al., 1997) although with TBS, the effects can last longer (Walsh & Rushworth 1999). From studies in clinical neuropsychology repeated application of TMS is known to have some long-lasting effects in the treatment of clinical conditions like movement disorders, epilepsy, depression, anxiety disorders, stuttering and schizophrenia (Walsh & Cowey 2000). However, much higher dosages of TMS are being applied in the clinical use than in research. TMS is most effective when it coincides with a critical epoch of cortical processing. That corresponds to the time when single unit responses can be recorded from the homologous area in a macaque brain (Di Pellegrino & Wise, 1991; Schluter, Rushworth, Mills, & Passingham, 1999). These critical periods in some cases precede recorded ERPs (Walsh & Rushworth, 1999). A large population of neurons must fire in synchrony to produce ERP components. Therefore TMS may be able to give more precise estimates of timing of cognitive functions then ERPs, closer to single unit recordings. However, this needs to be further investigated. Apart from spatial and temporal resolution, it has been argued that TMS also has a functional or cognitive resolution (Walsh & Rushworth, 1999). PET, functional magnetic resonance imaging (fMRI), or EEG are all correlation methods, but correlation does not imply causation. TMS differs from them in the important aspect that it has a direct effect on the neural activity with observable causal effects on behavior. TMS does not only say which regions are the neural correlates of a given function but can also establish the causal necessity of a brain region for a cognitive process. As stated before, the popularity of TMS contrasts with the limited knowledge we have about the mechanisms by which it influences neural activity. There is a growing body of literature on the effects of TMS on both psychological functions and underlying neurophysiology. However, further research is still needed. Results of Edgley et al. (1997) suggest that the electric field induced by TMS probably stimulates axons and not cells. The effect depends on the relation between the orientation of the induced electric field and the shapes of the axons. The activation of axons occurs most likely at the point where the axon bends out of the electric field (Maccabee et al., 1998). The direction of the induced current and therefore also the population of activated axons depend on the orientation of the coil, especially in the case of the figure of 8 coil. The effects of TMS on physiology have been investigated and include e.g. enhanced spontaneous firing that then fades away, reduced visual-evoked activity and effects on hemoglobin concentration (Allen et al. 2007). Effects on cognitive tasks are usually disruptive, which is the reason why TMS is sometimes called a “virtual lesion” method (Pascual-Leone et al. 2000). The main evidence for the virtual lesion effect is that a TMS pulse first induces a synchronized high frequency activity in pyramidal output neurons for about 10 ms (Di Lazzaro et al., 2004). That activity is followed by a GABAergic inhibition (H R Siebner, Dressnandt, Auer, & Conrad, 1998) for several tens or hundreds of ms (Haug, Schönle, Knobloch, & Köhne, 1992; Inghilleri, Berardelli, Cruccu, & Manfredi, 1993). This mechanism effectively prevents the continuation of ongoing neural activity that might be relevant for task performance. However, TMS effects can be also facilitatory. Most obvious examples are muscle twitches after motor cortex stimulation and phosphenes as a result of occipital stimulation. There are also cases of “paradoxical lesions” in which cognitive performance gets improved after stimulation. For instance, TMS over V5 impaired attention to motion but improved attention to form and color in a visual search task (Walsh, Ellison, Battelli, & Cowey, 1998). Such effects can reveal competing or mutually inhibitory systems. Moreover, it is not the case that TMS effects are always excitatory. Subthreshold stimulation (which does not affect EMG) can inhibit the effect of subsequent suprathreshold stimulation (Kujirai et al., 1993). TMS has also been shown to decrease the regional cerebral blood flow (Paus et al., 1998). In rTMS, whether the effect is inhibitory or facilitatory can depend on the stimulation parameters (Rizzo et al., 2001). Another way of thinking about TMS mechanisms is in terms of signal and noise. TMS can be thought to induce noise, that is, activity that is random with respect to the task that is being performed. Harris et al. (2008) designed a task to investigate this hypothesis: Subjects in their experiment had to discriminate contrast gratings. This task was manipulated by adding either a visual noise, or a TMS pulse, or both. Effects of TMS and of visual noise were multiplicative rather than additive. Possible interpretation of this result is that TMS did not increase the amount of noise but rather caused a loss of signal. The conclusion drawn from these studies can be that TMS works in both ways. It creates virtual lesions and changes the signal to noise ratio. The balance between these effects depends on the stimulation intensity (Siebner et al. 2009). Higher intensities inhibit processing, while low intensities can rather be thought of as adding noise or removing signal from the processing. However, the mechanism is much more complicated and simple conclusions about what TMS really does may not be entirely possible. For instance, the appropriate amount of noise can paradoxically enhance processing (Siebner et al. 2009). Another route of explanation focuses on the influence of the state of the cortex on the produced effects. Simple demonstration is the observation of increased motor responses after the voluntary pre-contraction of the muscle. More subtle example is that a mere preparation of a grasping movement increases cortical excitability (Cattaneo et al., 2005). State of the cortex influences the responsiveness of distinct subpopulations of neurons. There is also evidence for a state dependency of TMS-induced spread of excitation to connected areas (Bestmann et al. 2008). Further evidence for the state-dependency theory was presented by Romei et al. (2008). They have found that alpha activity in the visual cortex predicted the phosphene threshold. However, this finding could also be explained by saying that the effect of TMS was always the same, but perceptual discrimination was influenced by alpha activity. It has been argued based on color adaptation studies that TMS has a greater effect on less active neurons (Silvanto, Muggleton, Cowey, & Walsh, 2007). However, TMS might also be inhibiting the most active neurons (Siebner et al. 2009). It is important to note, that activity in a region does not necessarily determine its excitability by TMS. Neuron is most excitable when its membrane potential is just below threshold but not when it is firing. Excitability depends on complex relations between a variety of factors, including the current rate of firing, amplitude of the input relative to noise, membrane resistances and potentials as has been demonstrated also by computational models (Matthews, 1999). In sum, TMS effects are clearly state-dependent, but it is difficult to interpret and predict these effects. To conclude, TMS pulse produces a brief high-frequency synchronized firing followed by a longer inhibitory post-synaptic potential (IPSP). This interferes with the normal cortical processing and results in a virtual lesion. The size of the lesion depends on the stimulation intensity and on the state of the cortex that determines its excitability. However, it is very difficult to explain and predict how a given state determines the effects of TMS stimulation. The aim of cognitive neuroscience is to understand brain-behavior relationships. We want to investigate what the functional components involved in a task are, where they are localized in the brain and when and how they interact to produce behavior. Functional dissociations have been a subject of study of neuropsychology. Further information about the localization of the functions comes from neuroimaging and some temporal characteristics of the processing can be investigated using EEG or magnetoencephalography (MEG). TMS has the ability to give us further insight in all of these areas. Its advantage over lesion studies is that with TMS one does not investigate abnormal damaged brain where reorganization and compensatory strategies may be the case. It overcomes the problem that some tasks may be too difficult for patients and that the number of patients with a similar lesion is usually low. Compared to neuroimaging, TMS does not investigate mere correlations, but causal relations. It is possible to ask questions about the timing of cognitive functions, necessity of different brain areas for a given function and about the dynamic connectivity between areas. For example, one debated question is, whether visual areas V4 or V5 are sufficient for awareness of their preferred attribute or whether interaction with V1 is necessary. Cowey & Walsh (2000) investigated this question in a patient with severely damaged V1 area in the left hemisphere. Normal moving phosphenes were elicited when stimulating the right V5 area, but no phosphene was produced by TMS over the left V5 area. This combination of real and virtual lesion suggests that V1 is necessary for movement perception. So far, TMS has been used to study many topics in the cognitive neurosciences, like perception (Corthout, Uttl, Walsh, Hallett, & Cowey, 1999), attention (Ashbridge, Walsh, & Cowey, 1997), learning (Pascual-Leone et al. 1994), plasticity (Walsh et al. 1998), language (Pascual-Leone et al. 1991) and awareness (Cowey & Walsh 2000). Because it is difficult to assess what TMS does to the brain in any given condition, TMS in cognitive neuroscience might be generally best thought of as an independent variable in an experiment. The dependent variables we can measure are e.g. reaction times, errors, d-prime, motor or phosphene thresholds, motor-evoked potentials (MEP), event-related potentials (ERP), BOLD signal or other physiological measures. One important consideration in TMS studies is the selection of the control site. This selection should be based on theory: We should have a hypothesis that the two areas have different functions and that they are not strongly anatomically connected, because we know that TMS can have large distal effects. It is also good to take into account the secondary effects of TMS that can produce a difference between conditions: sharp audible cracks and potential muscle twitches and eye blinks especially in the frontal regions. Neuroimaging is usually correlative rather than causal. There has been some development in mathematical methods for neuroimaging that can shed some light on the so called effective connectivity between brain areas, e.g. the dynamic causal modeling (Friston, Harrison, & Penny, 2003). Influences between brain areas have also been studied using a twin-coil TMS paradigm. Recent trend has been to use TMS in combination with neuroimaging. This way we can study connections in the brain, we can observe which areas are causally influenced by the stimulation, and how these effects depend on different states of the network in different cognitive tasks. For example, it has been hypothesized that frontal eye fields (FEF) modulate the visual cortex with respect to attention. It is not possible to prove such causal influence only with fMRI. But by applying TMS to the FEF it was possible to observe changes of the BOLD signal in the visual cortex. This stimulation also enhanced perceived contrast of visual stimuli (Ruff et al. 2006). Moreover, it is possible to combine TMS with EEG if we ask questions about the modulation of brain activity in time rather than about localization of that activity. Taylor et al. (2007) have found that TMS to FEF has a causal influence over the modulation of visual activity in posterior areas when attention is being allocated. There are technical issues connected to these approaches that limit their application to some degree. For instance, it can be difficult to use TMS inside a magnetic resonance scanner due to the strong magnetic field that the scanner produces. In addition, not all locations on the scalp are easily accessible with the TMS coil inside the scanner. It is possible to overcome these issues by using offline protocols, but these also bring some disadvantages. It might be necessary to use more complex protocols, sometimes there is an unknown duration of the stimulation effects, and some questions require the use of single pulse stimulation (Driver et al. 2009). TMS is considered to be a generally safe technique (Rossi et al., 2009). Safety of single pulse stimulation is well established, but repetitive pulses can cause seizures in some subjects. Consensual safety guidelines have been adopted after a workshop in 1996 (Wassermann, 1998) and a revised version has been elaborated at a workshop in 2008 (Rossi et al., 2009). These guidelines discuss among other issues the safe parameters of stimulation and should be consulted by everyone wishing to use TMS. There are some important precautions that need to be followed. It is important to perform a good screening of participants. Subjects with a personal or family history of epilepsy or other neurological conditions should not take part in any TMS study. Another contraindication is the presence of a metallic material in the head, e.g. a cochlear implant. However, even when following the guidelines seizures can occur. In 2009, when 741 participants had been stimulated with the TBS protocol so far, a seizure did occur in one subject without any risk factors for epilepsy or any medication. Among other adverse effects reported after TMS are changes in mood. Cases of crying and laughing after prefrontal rTMS have been reported (Wassermann, 1998). Little is known about the long-term effects of rTMS, but it can be assumed that they are possible, since rTMS has been used to alleviate depression, although these changes required several sessions of stimulation (George et al., 1995). Despite the general safety of TMS, caution is needed, especially because TMS research has expanded to researchers with no medical background, to labs not in proximity of medical facilities, and to a wide population of participants. Allen, E. A., Pasley, B. N., Duong, T., & Freeman, R. D. (2007). Transcranial magnetic stimulation elicits coupled neural and hemodynamic consequences. Science, 317(5846), 1918–1921. Ashbridge, E., Walsh, V., & Cowey, A. (1997). Temporal aspects of visual search studied by transcranial magnetic stimulation. Neuropsychologia, 35(8), 1121–1131. Barker, A. T., Jalinous, R., & Freeston, I. L. (1985). Non-invasive magnetic stimulation of human motor cortex. Lance. Butterworths, London. Bestmann, S., Swayne, O., Blankenburg, F., Ruff, C., Haggard, P., Weiskopf, N., … Ward, N. (2008). Dorsal premotor cortex exerts state-dependent causal influences on activity in contralateral primary motor and dorsal premotor cortex. Cerebral Cortex, 18(6), 1281–91. Brasil-Neto, J. P., McShane, L. M., Fuhr, P., Hallett, M., & Cohen, L. G. (1992). Topographic mapping of the human motor cortex with magnetic stimulation: factors affecting accuracy and reproducibility. Electroencephalography and Clinical Neurophysiology, 85(1), 9–16. Cattaneo, L., Voss, M., Brochier, T., Prabhu, G., Wolpert, D. M., & Lemon, R. N. (2005). A cortico-cortical mechanism mediating object-driven grasp in humans. Proceedings of the National Academy of Sciences of the United States of America, 102(3), 898–903. Claus, D., Weis, M., Treig, T., Lang, C., Eichhorn, K. F., & Sembach, O. (1993). Influence of repetitive magnetic stimuli on verbal comprehension. Journal of Neurology, 240(3), 149–150. Corthout, E., Uttl, B., Walsh, V., Hallett, M., & Cowey, A. (1999). Timing of activity in early visual cortex as revealed by transcranial magnetic stimulation. NeuroReport, 10(12), 2631–2634. Cowey, A., & Walsh, V. (2000). Magnetically induced phosphenes in sighted, blind and blindsighted observers. NeuroReport, 11(14), 3269–3273. Di Lazzaro, V., Oliviero, A., Pilato, F., Saturno, E., Dileone, M., Mazzone, P., … Rothwell, J. (2004). The physiological basis of transcranial motor cortex stimulation in conscious humans. Clinical Neurophysiology, 115(2), 255–266. Di Pellegrino, G., & Wise, S. P. (1991). A neurophysiological comparison of three distinct regions of the primate frontal lobe. Brain, 114 ( Pt 2(2), 951–978. Edgley, S. A., Eyre, J. A., Lemon, R. N., & Miller, S. (1997). Comparison of activation of corticospinal neurons and spinal motor neurons by magnetic and electrical transcranial stimulation in the lumbosacral cord of the anaesthetized monkey. Brain: A Journal of Neurology, 120 ( Pt 5(5), 839–853. Friston, K. J., Harrison, L., & Penny, W. (2003). Dynamic causal modelling. NeuroImage, 19(4), 1273–1302. George, M. S., Wassermann, E. M., Williams, W. A., Callahan, A., Ketter, T. A., Basser, P., … Post, R. M. Daily repetitive transcranial magnetic stimulation (rTMS) improves mood in depression. , 6 NeuroReport 1853–1856 (1995). Grafman, J., Pascual-Leone, A., Alway, D., Nichelli, P., Gomez-Tortosa, E., & Hallett, M. (1994). Induction of a recall deficit by rapid-rate transcranial magnetic stimulation. NeuroReport, 5(9), 1157–1160. Harris, J. A., Clifford, C. W. G., & Miniussi, C. (2008). The functional effect of transcranial magnetic stimulation: signal suppression or neural noise generation? Journal of Cognitive Neuroscience, 20(4), 734–740. Haug, B. A., Schönle, P. W., Knobloch, C., & Köhne, M. (1992). Silent period measurement revives as a valuable diagnostic tool with transcranial magnetic stimulation. Electroencephalography and Clinical Neurophysiology, 85(2), 158–160. Ilmoniemi, R. J., Virtanen, J., Ruohonen, J., Karhu, J., Aronen, H. J., Näätänen, R., & Katila, T. (1997). Neuronal responses to magnetic stimulation reveal cortical reactivity and connectivity. NeuroReport, 8(16), 3537–3540. Inghilleri, M., Berardelli, A., Cruccu, G., & Manfredi, M. (1993). Silent period evoked by transcranial stimulation of the human cortex and cervicomedullary junction. The Journal of Physiology, 466(3), 521–534. Kujirai, T., Caramia, M. D., Rothwell, J. C., Day, B. L., Thompson, P. D., Ferbert, A., … Marsden, C. D. (1993). Corticocortical inhibition in human motor cortex. The Journal of Physiology, 471(1), 501–519. Lontis, E. R., Voigt, M., & Struijk, J. J. (2006). Focality assessment in transcranial magnetic stimulation with double and cone coils. Journal of Clinical Neurophysiology, 23(5), 462–471. Maccabee, P. J., Nagarajan, S. S., Amassian, V. E., Durand, D. M., Szabo, A. Z., Ahad, A. B., … Eberle, L. P. (1998). Influence of pulse sequence, polarity and amplitude on magnetic stimulation of human and porcine peripheral nerve. The Journal of Physiology, 513(Pt 2), 571–585. Matthews, P. B. C. (1999). The effect of firing on the excitability of a model motoneurone and its implications for cortical stimulation. The Journal of Physiology, 518(Pt 3), 867–882. Pascual-Leone, A., Gates, J. R., & Dhuna, A. (1991). Induction of speech arrest and counting errors with rapid-rate transcranial magnetic stimulation. Neurology, 41(5), 697–702. Pascual-Leone, A., Grafman, J., & Hallett, M. (1994). Modulation of cortical motor output maps during development of implicit and explicit knowledge. Science, 263(5151), 1287–1289. Pascual-Leone, A., Walsh, V., & Rothwell, J. (2000). 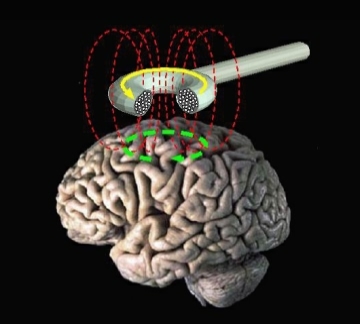 Transcranial magnetic stimulation in cognitive neuroscience–virtual lesion, chronometry, and functional connectivity. Current Opinion in Neurobiology, 10(2), 232–237. Paus, T., Jech, R., Thompson, C. J., Comeau, R., Peters, T., & Evans, A. C. (1997). Transcranial magnetic stimulation during positron emission tomography: a new method for studying connectivity of the human cerebral cortex. Journal of Neuroscience, 17(9), 3178–3184. Paus, T., Jech, R., Thompson, C. J., Comeau, R., Peters, T., & Evans, A. C. (1998). Dose-dependent reduction of cerebral blood flow during rapid-rate transcranial magnetic stimulation of the human sensorimotor cortex. Journal of Neurophysiology, 79(2), 1102–1107. Rizzo, V., Quartarone, A., Bagnato, S., Battaglia, F., Majorana, G., & Girlanda, P. (2001). Study and modulation of human cortical excitability with transcranial magnetic stimulation. Journal of Clinical Neurophysiology, 22(3), 229–232. Romei, V., Brodbeck, V., Michel, C., Amedi, A., Pascual-Leone, A., & Thut, G. (2008). Spontaneous fluctuations in posterior alpha-band EEG activity reflect variability in excitability of human visual areas. Cerebral Cortex, 18(9), 2010–2018. Ruff, C., Blankenburg, F., Bjoertomt, O., Bestmann, S., Freeman, E., Haynes, J., … Driver, J. (2006). Concurrent TMS-fMRI and psychophysics reveal frontal influences on human retinotopic visual cortex. Current Biology, 16(15), 1479–88. Schluter, N. D., Rushworth, M. F., Mills, K. R., & Passingham, R. E. (1999). Signal-, set-, and movement-related activity in the human premotor cortex. Neuropsychologia, 37(2), 233–243. Siebner, H. R., Dressnandt, J., Auer, C., & Conrad, B. Continuous intrathecal baclofen infusions induced a marked increase of the transcranially evoked silent period in a patient with generalized dystonia. , 21 Muscle nerve 1209–1212 (1998). Silvanto, J., Muggleton, N. G., Cowey, A., & Walsh, V. (2007). Neural adaptation reveals state-dependent effects of transcranial magnetic stimulation. European Journal of Neuroscience, 25(6), 1874–1881. Stokes, M. G., Chambers, C. D., Gould, I. C., Henderson, T. R., Janko, N. E., Allen, N. B., & Mattingley, J. B. (2005). Simple metric for scaling motor threshold based on scalp-cortex distance: application to studies using transcranial magnetic stimulation. Journal of Neurophysiology, 94(6), 4520–4527. Taylor, P. C. J., Nobre, A. C., & Rushworth, M. F. S. (2007). FEF TMS affects visual cortical activity. Cerebral Cortex, 17(2), 391–399. Walsh, V., Ashbridge, E., & Cowey, A. (1998). Cortical plasticity in perceptual learning demonstrated by transcranial magnetic stimulation. Neuropsychologia, 36(1), 45–49. Walsh, V., Ellison, A., Battelli, L., & Cowey, A. (1998). Task-specific impairments and enhancements induced by magnetic stimulation of human visual area V5. Proceedings of the Royal Society B Biological Sciences, 265(1395), 537–543. Walsh, V., & Rushworth, M. (1999). A primer of magnetic stimulation as a tool for neuropsychology. Neuropsychologia, 37(2), 125–35. Wassermann, E. M. (1998). Risk and safety of repetitive transcranial magnetic stimulation: report and suggested guidelines from the International Workshop on the Safety of Repetitive Transcranial Magnetic Stimulation, June 5-7, 1996. Electroencephalography and Clinical Neurophysiology, 108(1), 1–16. This entry was posted in English and tagged cognitive neuroscience, methodology, TMS by Ondřej Havlíček. Bookmark the permalink.